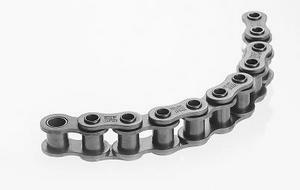 For standard situations, Tsubaki can provide you with an outstanding range of Attachment Chain. The chains are manufactured according to the American Standards. RF type is also available. As dimensions are different please consult Tsubaki. RS Type: Standard RS Roller Chain sprocket can be used. RF Type: Double Pitch Chain sprocket can be used. RS sprocket can be used with S Roller type when there are more than 30 sprocket teeth.